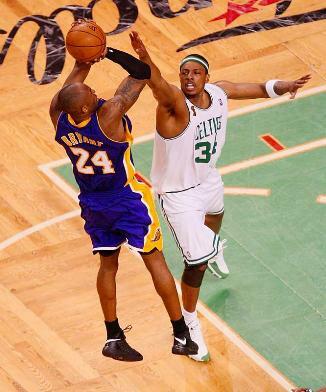 Here we are in the 4th quarter of game 4 of the NBA Finals of the Lakers vs Celtics. Big Baby Davis is absolutely on fire here in the fourth quarter and the Celtics are now giving the Lakers a bit of a run. But here’s the thing – the Celtics are right now playing at a very high level of energy and execution. However, the lead is only 8 over the Lakers, and this is something that should be a concern for Celtics’ fans and the Boston players. Look at this comparatively – if the Lakers are on fire like the Celtics are at the moment, what would you say the lead would be right now? I would say that when the Lakers are on fire like the Celtics, the lead is easy into the double digits – like 15 – 20. But the Celtics are on fire, and the lead is sitting at what, 8 points? I don’t know – the Lakers don’t look like they are playing at their best. In fact, the Lakers are looking sloppy and missing a bunch of offensive and defensive plays. But yet again, the lead is only 8 – or 9 now. And now what’s killing the Celtics? 2 technical fouls in the last 2 minutes.